1-easy, easy, easy -20 minutes of “prep” and then 5 hours of waiting. 3-very economical. 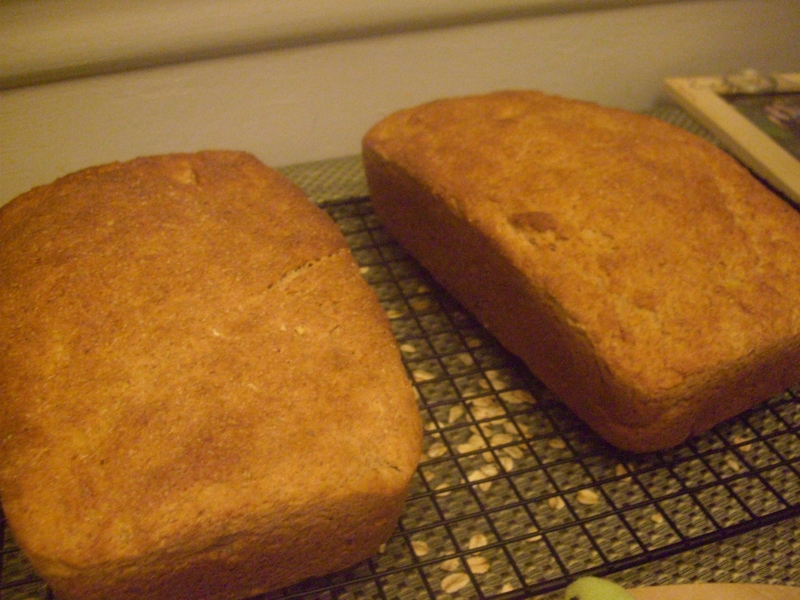 My average cost per loaf is $1.63 (including electricity) for organic healthy bread. That saves me a little over $1 a loaf for the wheat bread we were buying. I heat my milk in the microwave. It takes approximately 6 minutes. You want to heat your milk to just below boiling. 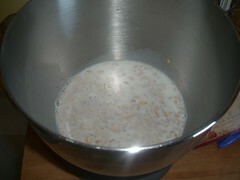 Step 5: After oatmeal has cooled down to “warm”. 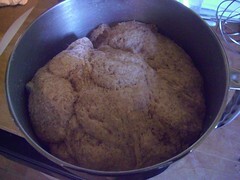 Take a separate bowl and pour 1/2 cup very warm water, 1 tsp honey and 2 tbs yeast into it. Whisk these together just until mixed (don’t over whisk). Let rise 5 minutes. 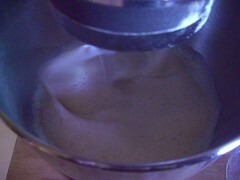 Mixture should begin to foam up (see picture) if it does not work try again! Step 6: Add the yeast mixture, butter, remaining honey and salt to the oatmeal mixture and stir using kitchenaid mixing attachment until mixed. 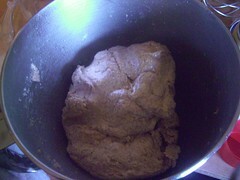 Step 7: Slowly add wheat and white flour. Stir until mixed. For this I usually place a small pie pin of warm water in the bottom rack of my oven. I then turn it on to low…and then turn it off. 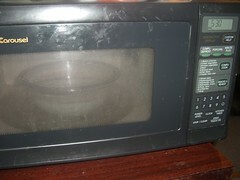 I place the bowl in the turned off oven with the door closed. I cover the bowl with a towel that is damp with hot/warm water. 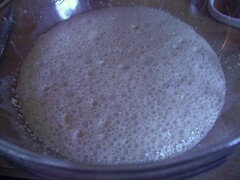 Step 10: After dough has doubled punch down. 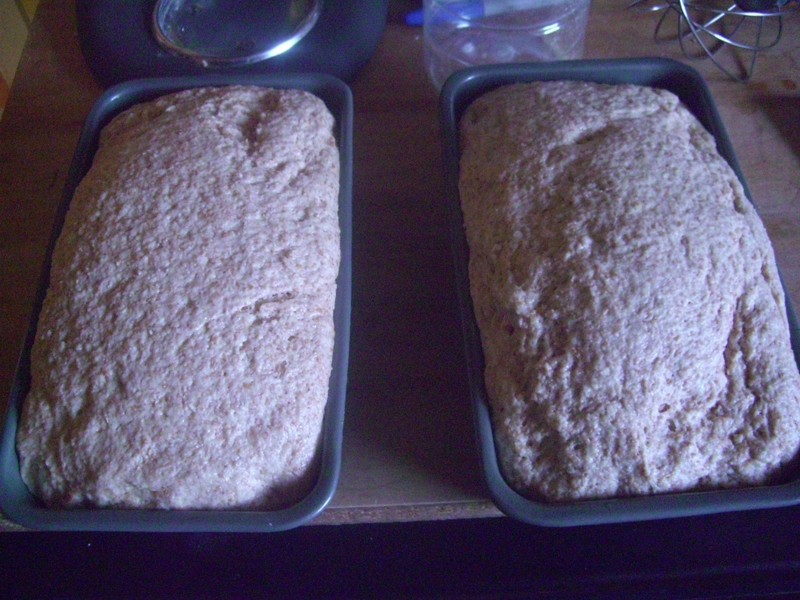 Divide in half and shape into loaves. Place in greased bread pans seam side down. Re-cover and place in warm dark humid place and allow to rise for 1 hour or until doubled. Step 11: Heat oven to 375 degrees. 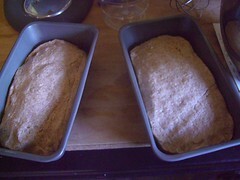 Place loaves in oven and cook for 35-45 minutes or until you can tap on the bottom and the bread sounds hollow. 1-How long does your bread last? I slice my bread when I need it, this keeps the loaf moist. I also make sure it is sealed in the ziplock bag. 3- Can you freeze your bread? Yes! It works great! Then I just defrost and serve. I do this sometimes when I am giving someone a meal, then I have bread on hand to give them with their soup or cassarole. 4- Can I do this recipe in my breadmaker? I don’t think so, but I don’t have a breadmaker, give it a try and let me know. I do recommend baking outside the breadmaker though in the oven as your bread will taste better (in my opinion). Before my breadmaker died I used it for the first few processes and then I would transfer the dough to bread pans for the final rise and baking process. Be sure and let me know in the comment section what works for you! 5- what size is your kitchenaid? Mine is just the “standard” kitchenaid not he industrial. 6-Can I make this without the kitchenaid? YES! 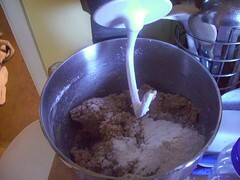 Just mix the ingredients by hand, and then knead by hand for 10 minutes (instead of 8 with the kitchenaid). Have fun and let me know how it works for you! This recipe is enough for almost 200 loads of laundry! -this is a common “green cleaning” ingredient and you can find it in the laundry section of pretty much any grocery store. Using a vegetable peeler or grater grate 1/3 of your soap bar into 6 cups of water (in a pan). Heat on a low-medium heat until the soap is dissolved. Put approximately 4 cups of warm water in your four gallon bucket. 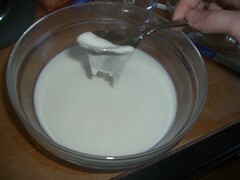 Add your soap mixture and stir. Fill the bucket to the 2 gallon mark with cold water. After 1 hour set the timer for every 10 minutes and stir the soap every 10 minutes. When cool add a few drops of essential oil (if desired) and pour into milk jugs or into old liquid detergent bottles. Use 1 tbs/ load of wash. Approximate start up cost (buying materials to make = $10) You’ll have enough though to make lots and lots of batches!